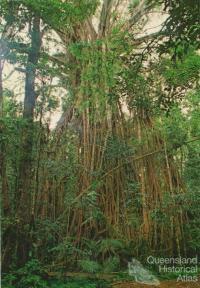 Trees are found in most Queensland landscapes. Rainforests and eucalypt forests, exotic pine plantations, jacarandas and bottle trees in city streets and gardens, exotic camphor laurels providing shade in school yards, the lone gum in a grazed paddock are all familiar to Queenslanders. Some trees, like the bunya pine and macadamia, are endemic to Queensland and were claimed as the ‘Queensland pine’ and the ‘Queensland nut tree’. Others trees, like hoop and kauri pine, commonly associated with Queensland are also found in northern New South Wales. 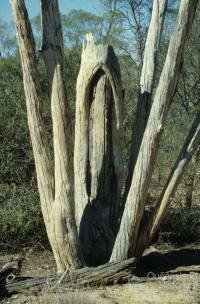 The hard wood gidgee or stinking wattle is found on the cracking clay soils in western Queensland. The timber is extremely dense while the leaves exude a stringent ‘rotten meat’ odour after rain. The flowering of the exotic jacaranda in October and November reminds students that exam time looms. Some Queensland trees have special or distinctive qualities. Satinay, found on Fraser Island and in parts of Cooloola, is resistant to the marine toredo worm and was used for navigational markers and as piles for wharves. It was used to build the London docks in the 1930s and as piles for the Suez Canal. Termites do not attack cypress pine so this tree has become important in house construction, especially in western regions. Unlike most trees, the timber from hoop pine is tasteless and odourless and before plastics was used to make butter boxes. 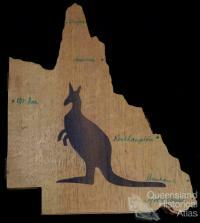 For the Aboriginal peoples of what is now Queensland, trees are a vital part of the world created by ancestral beings. Trees provided food, shelter, medicine and raw material for watercraft and implements. Some trees held spiritual or ceremonial significance or were used for burials. Although large trees are rare in the Torres Strait Islands, large logs were imported from the Fly River area of Papua New Guinea for construction of ocean-going canoes. In southeast Queensland, tribes traditionally travelled to the Blackall Range and the Bunya Mountains to harvest bunya nuts and to conduct business. Trees were sometimes ‘scarred’ when bark was removed to make canoes, shields, coolamons and other objects. Bark from some trees, such as the kurrajong, was used to make fibres for fishing nets. Some trees were scarred as memorials to indicate burials or other important places, and in parts of Queensland trees were marked with complex engravings (known as 'dendroglyphs') with symbolic meanings. In western Queensland, the leaves and twigs from a tree – Duboisia hopwoodii or pituri – were harvested, dried in a fire and mixed with ash. The narcotic this process produced was traded as far as the southern coast of South Australia. 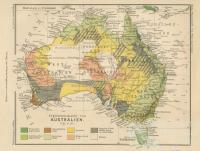 Early colonists in Queensland found a mosaic landscape of eucalypt forests, dense rainforest ‘scrubs’ and open grasslands. As settlers moved up the coast, they fought the land as much as they fought the original owners of the land. 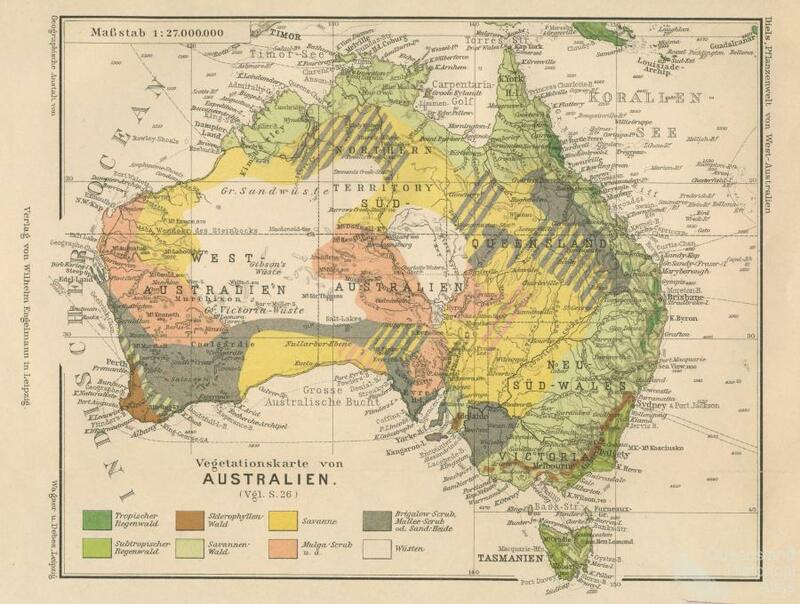 Trees stood in the way of settlement, and timbergetters (often with Aboriginal guides) preceded farmers and settlers. Men on springboards felled acres of forest in ‘drives’. Mining used vast quantities of hardwood timbers for props and as fuel. In order to select land under various Closer Settlement Acts, selectors had to make ‘improvements’ which included clearing most of their selection. The timber industry was one of the first in the new colony. The first sawmill in Queensland was built by William Pettigrew in Brisbane in 1853 and twenty years later the first steam locomotive was built in Maryborough to draw timber to his mill at nearby Dundathu, named for the Aboriginal name for kauri pine. 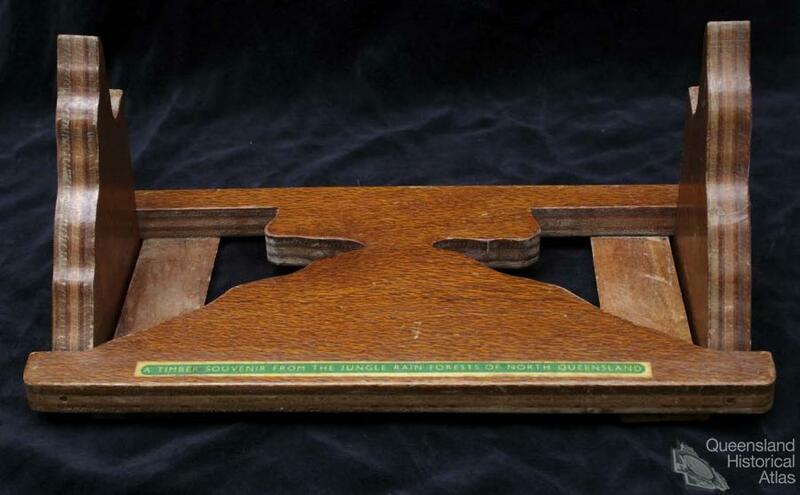 Timber was a resource to be exploited and prized and in 1865 Amalie Dietrich won a gold medal at the Paris Exhibition for a display of fifty timber specimens. Timbers had a wide range of uses. 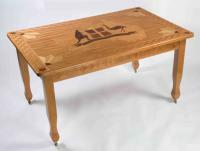 Hoop pine floors and red cedar furniture were common in houses. 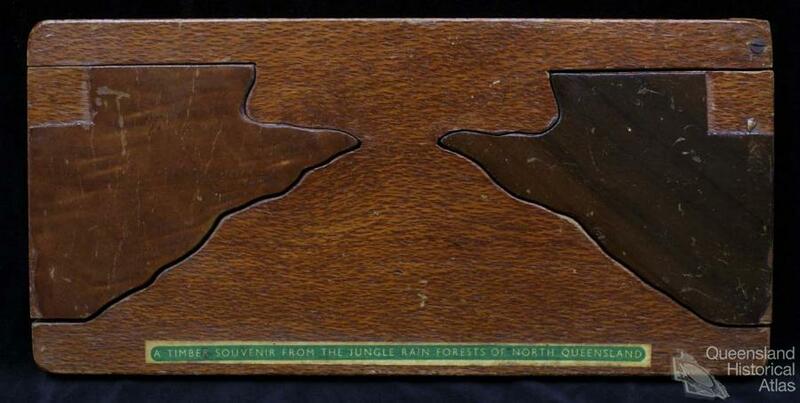 Hardwoods were used for railway sleepers, telephone poles and for navigational markers. Hoop pine, originally called Moreton Bay pine, made up three quarters of all timber used in wooden buildings in Queensland in the late nineteenth century. As supplies of timber became scarce, laminates became popular as decorative timbers on furniture. Moves to better understand, protect, and replace forests paralleled their exploitation. Acclimatisation Societies existed around the world to promote the study of natural history and, with often disastrous results, the introduction of new species to the colonies. In 1873, a conference of the Acclimatisation Society in Brisbane called for forest conservation and in 1900 a Forestry Branch was established within the Department of Public Lands. 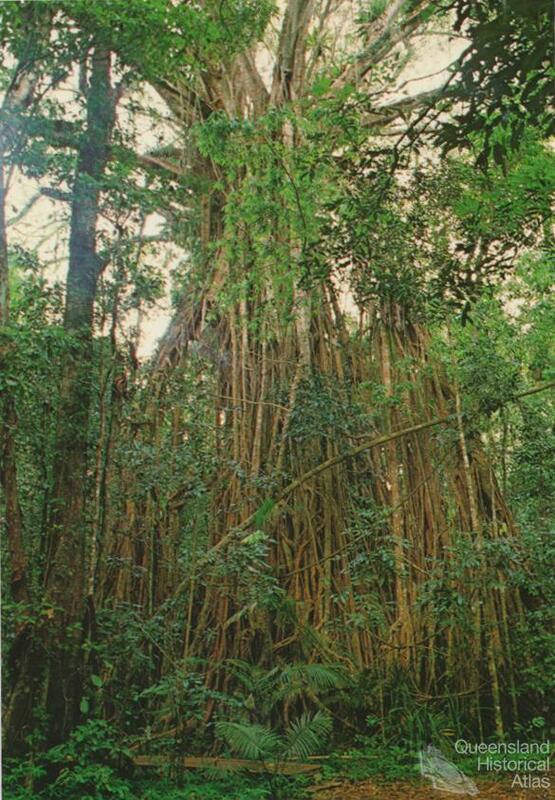 Experiments in silviculture, the growing of trees, began in the late nineteenth century with trials of kauri plantings on Fraser Island and red cedar in north Queensland. Failed soldier settlement land at Beerwah and Stanthorpe was used between the 1920s and the 1960s for the development of exotic pine plantations. 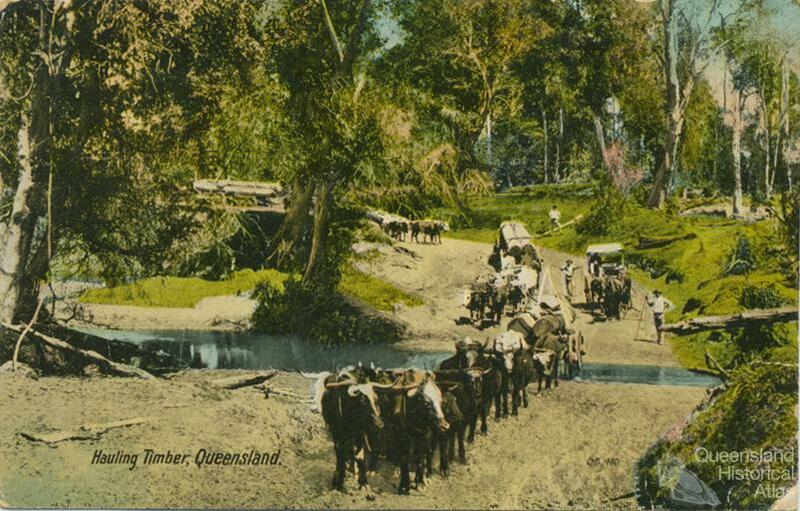 All timber was placed under the control of the Commonwealth during World War II and forests on Fraser Island, at Canungra and in the Atherton Tableland became military training areas. 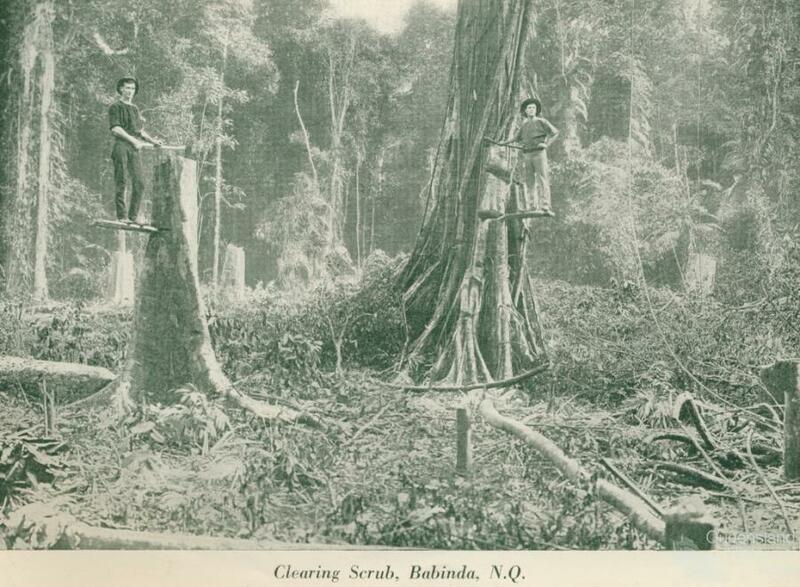 After the war, land clearing occurred at alarming rates. In Central Queensland, the Brigalow Scheme encouraged large scale clearing of brigalow scrub, often with chains dragged between two bulldozers. Trees in the Queensland landscape have changed with time and so have our attitudes to them. Introduced species are now part of the landscape: pine trees produce timber, jacarandas and exotic palms are planted in parks and gardens; others, like camphor laurel, have become pervasive weeds. Landcare has promoted the planting of trees, and threats from climate change have caused a rethink of the ways in which we use, and abuse, the forests of Queensland. Trees were once a resource to be exploited; native forests are now recognised as critical habitat and legislation to phase out large scale clearing of remnant vegetation was passed in 2004. Trees are a vital part of the carbon cycle. In 2002, Queensland joined Green Fleet, a project that offsets carbon emissions by planting trees. Within six years, over 355,000 trees had been planted on behalf of the government car fleet.